Darmstadt is a city in the Bundesland (federal state) of Hesse in Germany, located in the southern part of the Rhine Main Area. The city of Darmstadt was founded by the Counts of Katzenelnbogen in 1330, though settlement in the area is known to have been present as early as the late 11th century. However, the sandy soils in the Darmstadt area, ill-suited for agriculture in times before industrial fertilisation, prevented any larger settlement from developing, until the city became the seat of the Landgraves of Hessen-Darmstadt in the 16th century. As the administrative centre of an increasingly prosperous duchy, the city gained in prominence during the following centuries. In the 20th century, industry (especially chemicals) as well as large science and electronics (later information technology) sectors became increasingly important, and are still a major part of the city's economy. Darmstadt also has a large tertiary education sector, with three major universities and numerous associated institutions. Darmstadt is one of few cities (as opposed to smaller towns) in Germany which does not lie close to a river, lake or coast. It can also boast being the sunniest city in the state of Hesse. The chemical element Darmstadtium (atomic number 110) is named after it, having been synthetisized in GSI Helmholtz Centre for Heavy Ion Research in Darmstadt-Arheilgen. 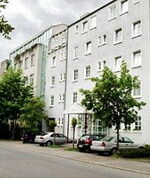 The Hotel Hornung is located in Darmstadt, Germany, 200 metres from the train station. The main town square, Luisenplatz, is two kilometres away and the Artists' Colony of Mathildenhohe is four kilometres from the hotel. Housed in a modern four-storey property, Hotel Hornung offers complimentary parking and a 24-hour front desk. Wireless Internet access is available throughout the hotel. Hotel Hornung provides a complimentary continental breakfast every morning. A bar serves local wines and beers. There is no restaurant on site, but Darmstadt city centre offers numerous dining options. Room service is available during the day. 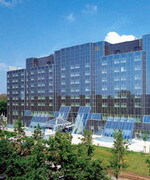 The Maritim Konferenzhotel is a modern 12-floor hotel situated in Darmstadt, two kilometres from the Hesse Museum and 17 kilometres from Frankfurt Airport. The 352 air-conditioned guestrooms feature traditional style decor in cream with dark wood furniture. Guests can chat over cocktails in the hotel bar, or relax in the sauna or solarium. An indoor pool is available for swimmers and guests have complimentary use of facilities at a nearby fitness centre. German and international dishes are on offer at the Landgraf, and in the summer the restaurant opens out on to a beer garden. Guests can read their emails using high-speed Internet or browse the daily newspapers over a cup of coffee in the lobby lounge. Nearby attractions include the natural history displays in the Museum of Hesse two kilometres away, and the villages and castles of Odenwald forest 20 kilometres away. Frankfurt Airport is approximately 17 kilometres and a 15-minute drive from the hotel. Located in Frankfurt's Darmstadt district, the Maritim Rhein-Main hotel features impressive conference facilities behind its shimmering blue-mirrored exterior. The 248 modern guestrooms have light decor and dark wood panelling, and look out over the city or garden square. All rooms feature satellite television with pay movies, direct-dial phones, minibars, dial-up Internet connections and ensuite bathrooms with hair dryers and makeup mirrors. Guests hosting functions can hire the elegant Hamburg Banquet Hall - complete with chandeliers, round tables topped with white linen and gold edged chairs; while business travellers can make use of the 11 conference rooms and high-speed wireless Internet. After a long day at work, guests can unwind with a drink in the Piano Bar. When the temperature drops, there is a steam room for visitors to warm up in or top up their tan in the solarium. Dortmund is a city in Germany, located in the Bundesland of North Rhine-Westphalia, in the Ruhr area. Its population of 587,830 (20 June 2005) makes it the 7th-largest city in Germany, and 34th-largest in the European Union. The Ruhr river flows south of the city, and the small river Emscher flows through the municipal area. The Dortmund-Ems Canal also terminates in the Dortmund Port, which is the largest European canal port, and links Dortmund to the North Sea. Dortmund is known as Westphalia's "green metropolis". Nearly half the municipal territory consists of waterways, woodland, agriculture and green spaces with spacious parks such as Westfalenpark and the Rombergpark. This contrasts with nearly a hundred years of extensive coal mining and steel milling within the city limits. 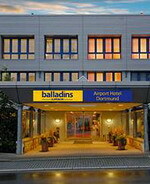 Balladins SUPERIOR Airport Hotel Dortmund is located in Dortmund, Germany, just 2.5 kilometres from Dortmund Airport and nine kilometres from the city centre. Staff at the 24-hour front desk can help with booking excursions and making reservations. The hotel offers garage parking facilities and discounted access to a nearby fitness centre for guests. 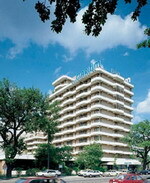 Balladins SUPERIOR Airport Hotel features a relaxed, contemporary restaurant serving international and regional dishes. A bar offers drinks and hot snacks. Conference facilities including meeting rooms, audiovisual equipment, and wireless Internet access are available. Guestrooms feature contemporary furnishings and light, warm decor. Amenities include satellite television with pay movies, safes, and complimentary wireless Internet access. Built in 1995, the Pullman Dortmund is a five-floor conference and leisure hotel situated in Dortmund in the Ruhr area of Western Germany, just 250 metres from Westfalenhallen Convention Centre and beautiful Westfalenpark. It offers 226 guestrooms featuring simple, light decor with modern furnishings. All include air conditioning, satellite television with pay movies, wireless Internet connections, direct-dial phones and minibars. Bathrooms have bathrobes and hair dryers. Guests can dine on international and Mediterranean cuisine in the restaurant, and enjoy a drink in the traditional, intimate bar. They can also work out on the fitness equipment, relax in the spa tub, sauna and solarium, and pamper themselves with a massage and rejuvenating beauty treatments. Staff at the 24-hour front desk can advise on the local area and arrange tours and excursions, while business guests can benefit from the business centre and conference facilities for up to 780 people. 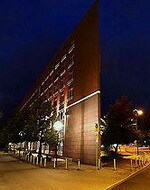 The Steigenberger Hotel Dortmund is a modern hotel located 200 meters from Westfalenhallen Exhibition Centre in Dortmund, Germany. The city center is positioned two kilometers from this property. On-site restaurants include Maxx Retaurant that serves regional, American and international dishes in a relaxed setting. The American Bar features a Wurlitzer jukebox, and the Summer Terrace offers an attractive garden where afternoon coffee and famous Dortmund beer is served. Wireless Internet access is available throughout the hotel, and function rooms accommodate group events. The Beauty and Wellness Centre contains a gym with cardiovascular and weight-training equipment. Leisure time may be passed in the sauna, the steam room or in the solarium. Practical hotel amenities include currency exchange, dry-cleaning services, a gift shop and 24-hour front desk services. Dresden is the capital city of the Free State of Saxony in Germany. It is situated in a valley on the River Elbe. The Dresden conurbation is part of the Saxon Triangle metropolitan area. Dresden has a long history as the capital and royal residence for the Electors and Kings of Saxony, who for centuries furnished the city with cultural and artistic splendour. The city was completely destroyed by the controversial Allied aerial bombing towards the end of World War II. The impact of the bombing and 40 years of urban development during the East German socialist era have considerably changed the face of the city. 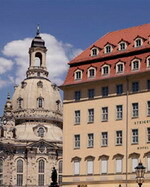 Some restoration work has helped to reconstruct parts of historic inner city, including the Katholische Hofkirche, the Semperoper and the Dresdner Frauenkirche. Since the German reunification in 1990, Dresden has re-emerged as a cultural, educational, political and economic centre of Germany. The contemporary Art'Otel Dresden in Dresden, Germany is located in Dresden's historical centre 300 metres from the Zwinger Palace and 500 metres from the opera house. The 174 bright, modern guestrooms have wall-to-wall windows and smart furnishings. All rooms are air-conditioned and include satellite television, direct-dial phones, hair dryers, and minibars. Wireless Internet access is complimentary. Guests at the Art'Otel Dresden can wind down in the sauna and solarium, browse the art gallery and enjoy drinks and snacks in the gourmet café. Business services include modern air-conditioned conference rooms with state-of-the-art technical equipment for up to 500 delegates. After a day of business guests can work out at the fitness centre or relax with cocktails in the bar. 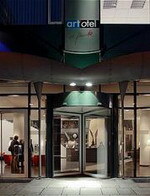 At the Art'otel Dresden, Dresden, the Restaurant Factory serves international dishes in a relaxed, contemporary setting. Dresden is a unique and splendid composition - hardly any city in Germany is blessed with history and culture as well as outstanding landmarks and a vivid night life. The famous silhoutte of the historic old town with the Semper Opera House, the Residential Castle and the reconstructed “Church of our Lady” is part of the UNESCO World Hertige. The mix with an enchanting landscape and unforgettable events composes the unique charme of the metropolis on the Elbe. And right in the middle - the Hotel Taschenbergpalais Kempinski Dresden. As a highlight of baroque architecture the Taschenbergpalais combines timeless elegance and grand hospitality with highest comfort. Experience the extraordinary cordiality in a historic ambience and feel at home in one of the best-known luxury hotels of Germany. With it's wide range of light Mediterranean and unconventional food and its huge assortment of exquisite wines the restaurant Intermezzo has become a popular meeting point of many gourmets. In summer you can enjoy an exceptional atmosphere at our Inner Court Yard. The Romantik Hotel & Restaurant Pattis is located in Dresden, Germany, four kilometres from the city centre. Moritzburg Castle is 19 kilometres away and the town of Meissen is at a 22-kilometre distance. 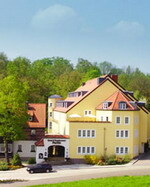 The city's main train station is five kilometres from the hotel and Dresden Airport is 10 kilometres away. Set in lush parkland, the boutique, rustic-style Romantik Hotel Pattis occupies a former mill house, and opens to interiors combining modern and traditional design with soft, neutral fabrics and dark wood furnishings. The hotel houses a wellness area offering a sauna, steam room, and range of beauty and massage services including Ayuverdic treatments. There is a multilingual concierge on hand to offer sightseeing assistance, and guests can relax with a drink by the fireplace or in the library. Further amenities include room service, laundry facilities, and complimentary wireless Internet. The Romantik Hotel Pattis houses the bright, modern Restaurant Vitalis with park views, serving international dishes, and the more traditional Gourmet Restaurant which offers French cuisine with Saxon influences. An extensive wine list is available. The Steigenberger Hotel de Saxe is located directly on the Neumarkt, in the historical centre of Dresden, opposite the "Frauenkirche" (Church of our Lady) and is therefore the ideal staring point for numerous activities in the baroque "Elbflorenz“. How about a walk to the Bruehl Terrrace directly on the banks of the Elbe? The Elbe valley, which is a listed UNESCO world-heritage site, is well worth a visit. Whether its glorious embankment boardwalks, interesting museums and establishments, technical memorials or endearing details - Dresden has lots to discover. When all the factors harmonise together, then is the gastronomy perfect. Like in the Restaurant de Saxe: guests enjoy the impressive view of the “Frauenkirche“ (church) and “Neumarkt”, exclusive flair, first class service, selected wines and the highest standard of cuisine. Whether it’s light and healthy dishes, regional and international specialties or the morning breakfast buffet -no wish is left open. Eisenach is a city in Thuringia, Germany. It is situated between the northern foothills of the Thuringian Forest and the Hainich National Park. The Wartburg castle is by far the most popular tourist attraction. 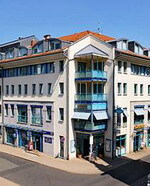 The Göbel's Sophien Hotel is family run, 4 star and is located in the heart of Eisenach. The market and the pedestrian zone, the theater and City are just 2 minutes walk. This Eisenach property is located near Lutherhaus. 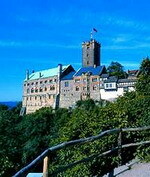 Another nearby point of interest is Wartburg Castle. Recreational amenities at Göbels Sophienhotel include a spa tub, a sauna, and a steam room. Other amenities include a full-service health spa, a restaurant, and complimentary breakfast. Guestrooms have satellite television, minibars, and complimentary newspapers; bathrooms include bathrobes, hair dryers, and handheld showers. 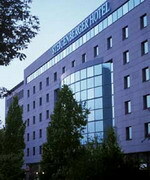 Steigenberger Hotel Thuringer Hof is a city-centre hotel in Eisenach in Central Germany. 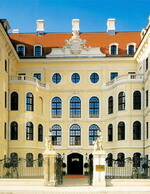 The hotel is located on Kalsplatz facing the city's famous Martin Luther monument. Erfurt Airport (ERF) is 60 kilometres away and takes approximately 40 minutes to reach by car. Active guests can visit the health club and work out on fitness equipment before relaxing in the sauna. The hotel has a bar and restaurant and room service is available (limited hours). Wireless Internet is provided in the public areas and the concierge can assist with theatre bookings. Business facilities include eight rooms for up to 200 delegates. Garage parking is available nearby.